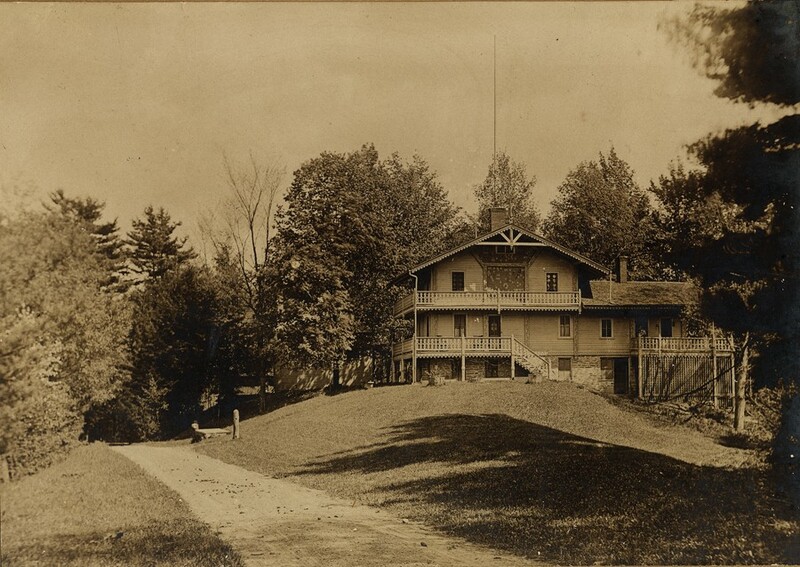 A swiss "cottage" once stood at the west end of the Council Grounds in Letchworth Park. It was the home of the caretaker of the Council Grounds and the homestead area of the Glen Iris Estate, and was one of two swiss style structures that stood in the Park. The other, Lauterbrunnen, still stands. The first image below is a real photo postcard shared by Karen Gibson Strang. The second view, also taken from the road west of the cottage and grounds, compliments the first image. Our friend Ted Bartlett sent us that view along with its interesting history. This real photo postcard was taken west of the Council Grounds. The photographer (Washburn perhaps?) has stopped his buggy in the road and photographed the caretaker's house on the west end of the Council Grounds in Letchworth Park. The Council House, Mary Jemison's grave, and the other structures are in the grove of trees beyond the swiss cottage. 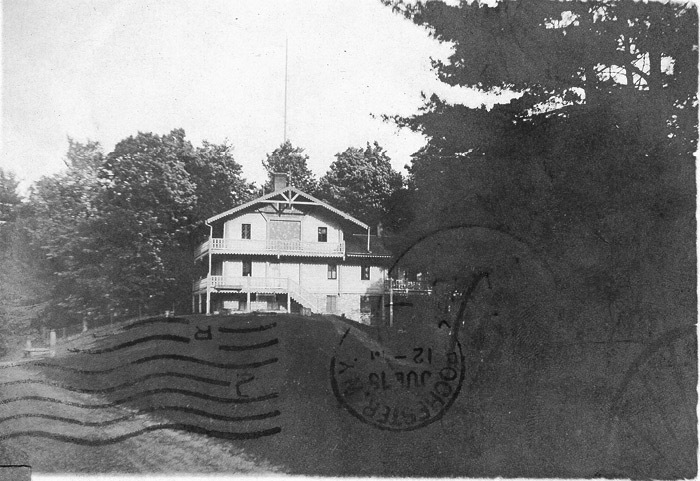 If you look closely you can see the top of the tall flag pole Mr. Letchworth had erected on the Grounds. See the image below for more details. Thanks to Karen Gibson Strang for sharing this image with us ! This photograph was taken from the same general direction as the real photo postcard above. This view, however provides more details on the swiss cottage and the neighboring grounds. You can clearly see the back of the Genesee Valley Museum and other buildings to the left of the main house. "Just came across this Washburn image that I thought you might like on the site.... It is a mounted and framed photo that was from my Dad's collection; it used to hang in my grand-dad's dentist office. It was a gift to him from his hunting and fishing buddy Charlie Van Arsdale. the notations on the back are kind of fun. " Then it was taken down sometime in the 1890s (notation 2) by Mr. Letchwroth and moved to the Council House Grounds. This picture shows the building on those Council House Grounds. It was built entirely of chestnut lumber, natural finish of the woodwork inside with a polished piano finish. (1) Original location was actually farther towards the Upper Fall, about 1/4 of the way between the middle and upper falls. (A) it was built by Letchworth for use as a guest house, with fountain, landscaping and superb both ways along the river. (B) When it was moved to the CHG the wing was extended longer that the wing was when it was by the falls. (C) I have no reference to the railings being iron, however, inlooking at the photos of this building and comparing them to the other Swiss building ( the railings on that one [Lauterbrunen] are wood, it would appear that these may well have been iron from their profiles and installation. it would be an interesting archaeological dig at the site. Of the two Swiss buildings this one appears to have been the more formal and finer detailed of the two. (D) The location of the Swiss Cottage was not in the parking lot area; it was further east towards the museum building and flag pole with cannons. The camera man was standing in what is now the parking lot, before it was raised about 10 feet in the 20th century. (E) The photo appears to be one of a series taken by Washburn of Castile. (F) My Dad's comment about when it was moved is probably wrong, to the best of my knowledge it was relocated in the 1890s and does not appear on the 1890s map of the Council House Grounds. (G) It was torn down in 1913 by American Scenic and Historic Preservation Society"
Thanks to Ted Bartlett for sharing this great image and additional information with us !